Welcome to Advanced Auto Body & Glass; the premier auto body collision repair center of the Red River Valley. 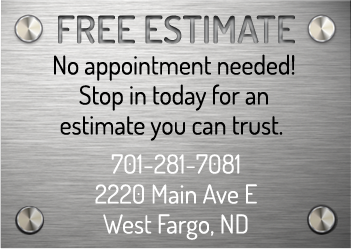 The communities of Fargo, Moorhead and West Fargo have come to rely on our collision repair team for good reasons. We have dedicated our careers to pristine auto body repairs and we are committed to your satisfaction. Whether a windshield chip repair (Free!) or a complete paint job, Advanced Auto Body & Glass will deliver outstanding bodywork from start to finish. We will work with your insurance company to ensure timely repairs and payment. Welcome to collision repair as it should be, we are collision repair experts. Thank you to each person that had a part in fixing my Yukon. To the first person that welcomed me, helped me with my car rental, to the guys in the shop to the guys who waited when I was late – your company is the best in town for SO many reasons.